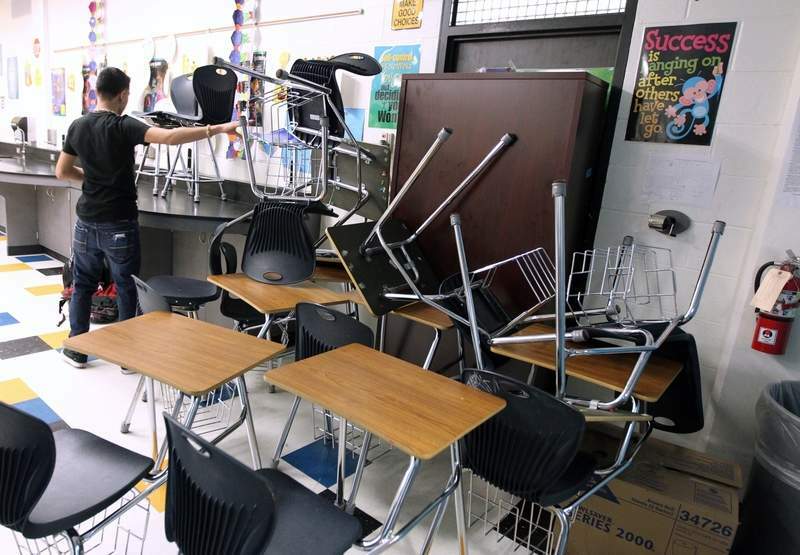 Associated Press A student helps block a classroom door with furniture during a 2013 lockdown drill at Moody High School in Corpus Christi, Texas. BUFFALO, N.Y. – Long before an ex-student opened fire on his former classmates in Parkland, Florida, many school districts conducted regular shooting drills – exercises that sometimes included simulated gunfire and blood and often happened with no warning that the attack wasn't real. April Sullivan was pleasantly surprised by an “I love you, Mom” text from her daughter in May, even though she knew the eighth-grader wasn't supposed to be using her cellphone during school in Short Pump, Virginia. But she did not know that her child sent it while supposedly hiding from an intruder. The girl didn't know the “code blue” alert was a drill. Thirty-nine states require lockdown, active-shooter or similar safety drills. Other states have less explicit requirements or leave it to districts, according to the Education Commission of the States. A Mississippi task force has proposed active-shooter drills twice a year. But even as the drills become routine for many of the nation's 51 million elementary and secondary public school students, there is no consensus on how they should be conducted, experts said. No data exist, for example, to show whether a drill with simulated gunfire is more effective or whether an exercise that's been announced in advance is taken less seriously than a surprise. “Some hard data on each question are needed with urgency,” said University at Buffalo professor Jeremy Finn, who gathered experts from around the country to evaluate school security measures at a Washington, D.C., conference in October. “Do you really want it to be your kid who's the one who takes the bullet and winds up with a plaque in the lobby of the school saying he went down as a hero?” asked Bethel Park, Pennsylvania, parent Nanette Adams, who disagreed with the decision to adopt a widely used safety protocol during a September drill at her 15-year-old son's high school. The protocol is known as ALICE, which stands for alert, lockdown, inform, counter and evacuate. “To me, this just seems like an indirect admission on the part of the schools that they really have no control over who gets into the building, and the school security officer isn't enough to keep the place safe so we need to hold the kids accountable for doing it,” she said. “I think that's baloney. They're very aware of what can happen in this day and age. They all see the news. They all see social media,” said Sullivan, whose daughter declined to be interviewed by The Associated Press but described the drill for Richmond television station WWBT a few days later.